While many customers are drawn to the classic styles of fireplace mantels, such as the French-Country designs, British Colonial designs, and Art Deco designs, an equal number of clients at SoCal Fireplace Mantels are seeking new, more modern styles for their fireplace surrounds. We offer a number of modern designs and materials designed to suit every taste and décor. New trends in fireplace mantels include designs influenced by modern trends in interior design. Some of these trends include flowing or curving lines, variations on geometric shapes, and even novel shapes and decorations that are influenced by local and international cultures. These new fireplace mantels are also moving beyond the traditional white or brown stone and include colored materials. SoCal Fireplace Mantels offers colored marble fireplace mantels, such as a cool green marble or dramatic red marble, as well as travertine mantels, granite mantels, cast stone mantels, and much more. At SoCal Fireplace mantels, we offer hundreds of design options from the traditional to the most cutting edge contemporary designs. 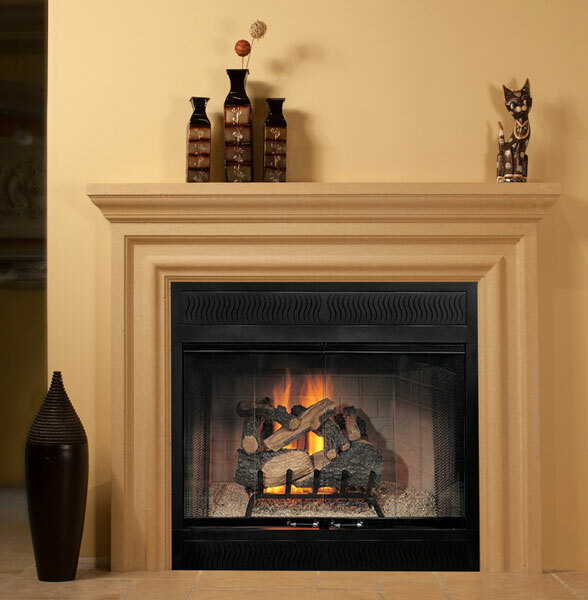 If after viewing our extensive selections of fireplace surround designs and materials you still do not find exactly what you are looking for, we will design a custom fireplace mantel or surround just for your needs. Our skilled design consultants are even available to come out to your home or business to view your interior design personally to help them create a custom design that fits your needs. Call or stop by our showroom today to get started with a custom design or to choose one of our many designs for your fireplace.